Carlie Trosclair ’08 (visual arts), M.F.A., St. Louis, Mo., had her exhibition, Interim, displayed in the Haas Gallery on Bloomsburg University’s campus. Her next upcoming solo exhibition will be held at Antenna Gallery in Los Angeles, Calif.
Andrea Rubin, J.D. 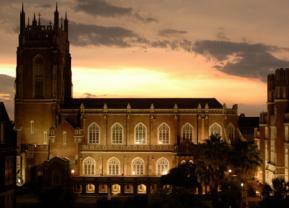 ’08, New Orleans, La., is the assistant director of student conduct at Loyola University New Orleans. Some of the issues she handles include visitation, underage drinking, illegal drugs, and sexual assault. Karen Hope Ressue ’08 (graphic design, marketing), and Kevin Andrew Jacobsen were married in the presence of their close family and friends at Congressional Country Club in Bethesda, Md., on October 7, 2012. Karen and Kevin currently live in Washington, D.C., where Karen works for a litigation law firm and Kevin is the assistant dean of students at Gonzaga College High School. Alexander McConduit ’08 (marketing), following the success of his books, The Little Who Dat Who Didn’t and Snowballs for All, founded a children’s publishing program called Write, Read & Illustrate to Educate (W.R.I.T.E. ), which he operated at SciTech Academy with 80 second-graders. Through W.R.I.T.E., Alex helps children foster their creativity by teaching them the basics of writing, illustrating, and publishing over a three-week period, and inviting guest presenters to speak. Alexander is still involved in freelance social media marketing, and he used fundraising site IndieGoGo to raise almost enough money to cover the cost of publishing all the students’ books using Amazon.com and CreateSpace. He currently is working on his third book, Buddy Goes to the Bowl, a sequel to The Little Who Dat Who Didn’t and the second in a series Alexander plans to continue. In addition, he was named to Gambit’s “40 Under 40” for 2012. Morgan Paige Martin ’08 (English), currently a high school English teacher in Nashville, Tenn., graduated with her master’s degree in education from Belmont University in 2011. Following that, she joined the Peace Corps, where she was then stationed in Kocani, Macedonia. While there, she not only taught English to her local school in a small town of about 18,000 people, but she also successfully constructed a dance studio in the basement of the school, after obtaining a grant through USAID, and established a dance camp. The fifth day of camp included a day-long rehearsal, followed by a recital. Jared Marcell ’08 (music industry studies), New Orleans, La., along with current students and brothers Sam and Collin McCabe, formed the band Bantam Foxes. They released a new single, “Interstate 55,” and they signed contracts to clear their catalog for use on MTV’s afternoon programming and on all of Discovery’s networks. Their record, Another Image, Another Frame, charted on the CMJ Top 200 at #171. Andrew Lopez ’08 (communication), joined The Times-Picayune and NOLA.com as a high school sports reporter. Andrew, who previously taught at Holy Cross High School, has covered high school sports as a contract writer for The Times-Picayune for the past five years. Laura Marie Fluke ’08 (biological sciences), received her doctor of osteopathic medicine degree from Oklahoma State University Center for Health Sciences on May 18, 2012. She was accepted to the General Surgery Residency Program at Naval Medical Center Portsmouth in Virginia. Karen Brazuk Cornwell ’08 (criminal justice), and her husband welcomed their first child, John Joseph Cornwell V, on August 21, 2012. Brianna Bennett ’08 (marketing), and Brian Ralston ’08 (economics) met during their freshman year at Loyola in their Intro to Business class. They tied the knot in Wilmington, N.C., on September 15, 2012, at Figure Eight Island Yacht Club. They were joined by several of their friends from Loyola. Brian is a judge advocate in the Marine Corps, and Brianna is a marketing manager for a marketing firm in Downtown Wilmington. Elisabeth Lorio Baer, J.D. '08, Elisabeth Lorio Baer, J.D. ’08, an associate at Liskow & Lewis, has been selected to New Orleans CityBusiness’ Leadership in Law 2014. She practices in the firm’s business and energy litigation sections and is a member of the New Orleans Bar Association, the Federal Bar Association, the Young Leadership Council, and the Women’s Energy Network Southeast Louisiana Chapter. She also serves as a member of the Woman Advocate Committee of the American Bar Association’s Section of Litigation. Shaawn Ali ’08 , Shaawn Ali ’08 (psychology pre-health) just completed his doctor of osteopathic medicine degree from William Carey University in Mississippi. CPT John Teschner ’07 (political science), O Fallon, Mo., was commissioned as a Second Lieutenant through the ROTC program as a Field Artillery Officer in 2007. He is a graduate of the Basic Officer Leader Course, the Field Artillery Basic Officer Leader Course, Paladin Commander Course, and the Field Artillery Captain’s Career Course. His prior assignment was as Battalion Fire Support Officer for 1st Battalion 2nd Infantry Regiment, where he served in Iraq as the Tactical Information Operations Officer and coordinator of all lethal and non-lethal fires in support of the maneuver mission. During his tour in Iraq, he spearheaded the Information Operations counter-fire team, which was directly responsible for denying the enemy the ability to conduct indirect fire operations against the Task Force. John’s awards and decorations include the Army Commendation Medal (2 OLC), Army Achievement Medal, Meritorious Unit Commendation, National Defense Service Medal, Iraq Campaign Medal (2 CS), Global War on Terrorism Service Medal, Army Service Ribbon, and Overseas Service Ribbon (2). Barrett Stephens, J.D. ’07, New Orleans, La., an associate at the Womac Law Firm, was named a Rising Star for 2013 by Super Lawyers. The rating recognizes the injury lawyer in New Orleans as one of the most promising practitioners in his field and in the state. Carlie Bloxom Spear, J.D. ’07, and her husband, Justin, are the proud parents of Elias Spear, born May 22, 2012, in Easton, Md. Jonathan Shaver, J.D. ’07, New Orleans, La., commercial realtor with Re/Max Commercial Brokers, Inc., was named to the “Ones to Watch: Real Estate” list by New Orleans CityBusiness. He worked as an associate at Wagner & Bagot before moving into commercial realty. His previous experience includes working as a commercial Realtor for HGI Realty, a law clerk with Ostendorf, Tate, Barnett & Wells, and serving as an environmental enforcement legal intern with the U.S. Department of Justice. He is an active member of the National Association of Realtors and serves as the candidate guidance chairman for the Louisiana Chapter of Certified Commercial Investment Members.